Short term growth prospects are “baked in”, from the Walker/Vos/Fitzgeral regime. Interestingly, we have mixed signals from economic indicators (and no signal from some that are delayed — thanks, Trump!). 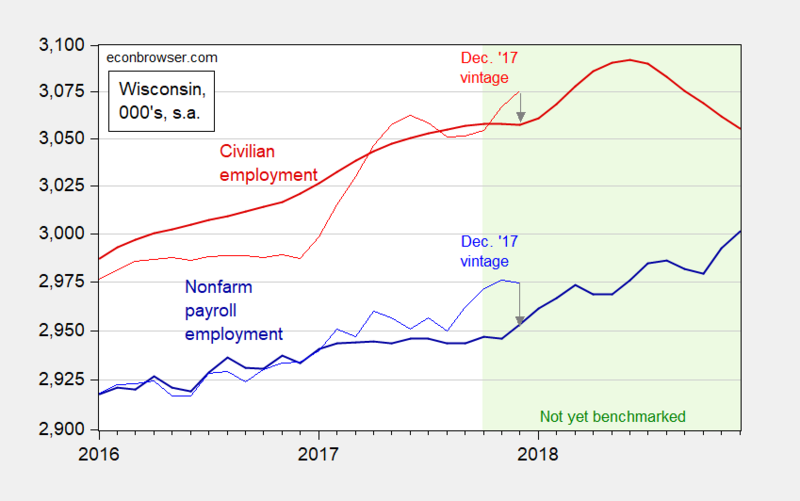 Figure 1: Civilian employment, Dec. 2018 release (dark red), and Dec. 2017 release (red), and nonfarm payroll employment, Dec. 2018 release (dark blue), and Dec. 2017 release (blue),all in thousands, seasonally adjusted. Light green denotes yet to be benchmarked data. Source: BLS, ALFRED. Note that the household survey based series, civilian employment, exhibits substantial benchmark revisions. But even the establishment series was noticeably revised downward. This provides hope the economy is still expanding. The Philadelphia Fed’s coincident index is still rising (as of December), but that measure is based in part on establishment survey data. What we are really interested in is prospective — instead of retrospective — changes. Unfortunately, the last available reading for the Philadelphia Fed’s leading indices is for October. The November reading was to have been released on January 4th, but that has been postponed indefinitely since the required Federal government releases were delayed. This entry was posted on January 31, 2019 by Menzie Chinn. My Wisconsin cheese purchases down here in the south haven’t kicked in yet?? Damn. You know I skipped getting the Roth brand Gouda spicy cheese last time. It’s $4.98 a pop for not that many grams. I love that stuff too man. Just went with the Hoffman’s Smoked cheese this time, more grams of cheese for only $3.68. I was kinda grumpy and resentful about that, but. Cheeses are so risky when you don’t know much about the flavor. They had some other Roth brand favors with the spice that were cheaper but I was too scared what they taste like. I’m weird—I generally hate cheese unless it’s refrigerator cold and cut very thin. I can’t explain it, it’s just one of my weird peccadillos I have, melted cheese makes me wanna gag, even the site of it, it’s like mayonnaise, I can’t bare it. That’s a trait I sorta share with Chinese people. Mainland Chinese hate cheese. Anyone recommend one of the cheaper Roth cheeses with spice cheaper than the Gouda one?? Menzie let’s be honest about it. Tony Evers is sharp, and I think he’s going to do a good job overall. But let’s be honest, he doesn’t fit the profile of a guy who knows his finance and is deeply engrained in ways to stimulate the economy. I think in this department it all depends on who Evers top 2-3 economic advisers are. That could possibly make or break his term success. If he doesn’t have the right guy as his head economic policy guy and a very structured idea what he is going to do the next 4 years and get at it first thing (the old “hit the ground running” cliche), Evers is going to be dead in the water before he can take his first breast stroke in the pool. I don’t know much or regularly follow Wisconsin politics, but so far, I haven’t heard any names announced in Evers cabinet to serve this function for the man. He better get on it if he wants to keep the job. I’m assuming Menzie has already read this. I’m also assuming (but do not know) this is about the best forecast and/or prediction you will find on the Wisconsin economy at this moment in time. If Tony Evers has any brains at all, he is calling Madison area Econ professors on the phone (Menzie or otherwise) and scheduling, lunch, Starbucks meetings, Beer garden meetings (my preferred venue) and brainstorming on this sh*t and figuring out who he is going to hire for economics policy, even if he has to create a new job for that task himself. If Tony Evers is not doing this ALREADY or as we speak he’s by default writing out his own pink slip as governor.